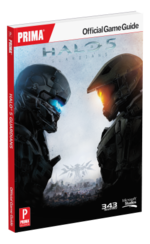 The Halo 5: Guardians Official Game Guide is the official strategy game guide of Halo 5: Guardians. It was released in the United States by Prima Publishing on October 27, 2015. It is available in two forms: the standard edition and the collector's edition. A code to access the eGuide, a digital version of the full strategy guide optimized for a second-screen experience. NB: The page numbers are from the Collector's Edition. On pages 5 and 6, the Prophet of Regret is mentioned three times as the leader of Covenant forces at the end of Halo 2 and during Halo 3, while in fact it was the Prophet of Truth. These errors were seemingly carried from the summaries in the Halo 4: Official Game Guide (Collector's Edition, pages 8 and 9). On page 6, the frigate UNSC Forward Unto Dawn is mistakenly called Foreword Unto Dawn. On page 7, it is said that Halo 4's story starts on June 27, 2557, while the correct date is July 21, 2557. On page 231, the images for the maps Raid on Apex 7 and Dispatch are inverted. On page 239, it is said that Theater was first available in Halo: Reach, while in fact it was first introduced in Halo 3. On pages 264-265, the Boltshot and its variants are missing among the weapons that players can request in Warzone. On page 266, the images for the Light of Urs and the Pool of Radiance—both variants of the Type-58 fuel rod cannon—are inverted. On page 267, the first variant of the Hydra launcher is called "Typhoon", while in the game it is spelled "Typhon". On page 275, the images for Endgame and Selene's Lance—both variants of the Spartan Laser—are inverted. From pages 280 to 284, the images for the Corp and Urban variants of UNSC vehicles are systematically inverted. On page 320, the Zealot Assassin boss is portrayed as a Sangheili in Warrior combat harness, while it is actually one of the few bosses in Warzone to wear its correct armor—in this case, the Hesduros Zealot harness. This error is also present in the boss kill list featured in Halo Waypoint's Halo 5: Guardians service record.